Over the past few years, getting perfect eyebrows has become more and more of a beauty craze. The “in” shape may change, and one year they might be bushier and thicker than others, but one thing is for sure, perfectly shaped eyebrows can make a huge difference for your face, and everyone has taken notice. Even though I’m a brunette, I’ve always had really light body hair, including my eyebrows. In the summer they get so light that they almost disappear. If you’re like me, eyebrow pencils, powders, and gels are your absolute best friend, especially when your days are spent in the sun. Learning how to shape and fill perfect eyebrows isn’t easy at the start, but with practice it will become second nature. Some tips to keep in mind: Go about two shades darker if you have light eyebrows, and two shades lighter if you have dark brow hair. Trying to match it tends to make your brows look less natural, and if you have dark hair already, using a dark shade will make them look really harsh. But I’m no eyebrow expert, so I’ll leave it to the pros! Check out these 9 eyebrow shaping tutorials for beginners and get the brows you’ve always wanted! If you’re looking for a tutorial that focuses fully on eye brow shaping, rather than filling, this is the one for you. You’ll learn how to achieve a natural brow shape that fits your face and makes your eyes pop! As she explains in the video, filling your brows in is more so when you have the hair already there, but this tutorial is geared at those of you who have over-plucked or may not have a lot of hair to fill in. She uses the Anastasia Beverly Hills Brow Whiz in Dark Brown, as well as the Brow Powder. In this tutorial, you’ll learn two methods for shaping and maintaining your eyebrows. You’ll need an all-white eyeliner, such as the Jane Cosmetics Eyeliner in Pure White, Tweezerman Tweezers and Cuticle Scissors, Tinkle Razors, and a makeup brush. Once you’ve shaped them to your desired look, use the Anastasia of Beverly Hills Dip Brow to fill them in. Your natural eyebrow shape might be gorgeous how it is, but sometimes it’s fun to switch it up a little. In this tutorial, you’ll learn how to change the shape of your eye brows, whether you want them straighter, or with more of an arch. When creating your desired brow shape with a pencil, she cautions not to use a color that is too close to your natural brow color. If you have black brows like she does, use a dark brown shade like the NYX Auto Eyebrow Pencil in Dark Brown. This will make it look less artificial. For this brow shaping tutorial, you’re going to need a few things. She recommends products such as the Sephora Angled Liner Brush to get your desired brow shape, plus the Lioele Auto Eyebrow Pencil in Grey Black and an Anastasia Beverly Hills Brow Palette. She shows you how to shape them after they’ve grown out to get the brows you’ve always wanted! If you have barely-there eyebrows, this tutorial demonstrates how to fill and shape them. Unlike most eyebrow tutorials, she recommends using eye shadow to fill in your brows, rather than an eyebrow pencil or palette. She uses Makeup Geek in Mocha. If you have really thin eyebrows, she shows you how to make them look thicker, and how to define and blend them for a natural look. You’ll learn to get a gorgeous, arched eyebrow shape with this tutorial. Using a business card and a white eye pencil, you’ll learn exactly where to draw lines for the right brow shape. She provides you with tips for plucking your brows, and suggests using Witch Hazel afterwards if you want to sooth the skin. From there, she shows you how to lengthen and fill in your brows in a way that creates the illusion of hairs. This video covers four basic eyebrow tutorials for beginners, plus four different looks depending on the brow shape. There are also tons of tips thrown in throughout the video, so it’s definitely worth a watch! She explains why different brow shapes work for different face shapes, so you can figure out which one will work best for you. You’ll need an eyebrow pencil such as the Etude House Drawing Eye Brow to create your desired shape and fill in your brows. With this tutorial, you’ll learn how to get the perfect eyebrow shape using an eyebrow stencil such as the Absolute New York Stencil Kit. She demonstrates a unique way to use the stencil, which is great if the stencil doesn’t fit perfectly to your eyebrow. You’ll also need an eyebrow angle brush and comb, as blending is a big part of this technique. The Anastasia Duo has both! In just three minutes, you can get perfectly shaped eyebrows using the techniques in this tutorial. Before shaping them, it’s important to brush your brows into place. Use a tool such as the Maybelline New York Brush ‘n Comb in order to see any gaps you need to fill in. She also uses the Benefit Hoola Bronzing Powder along with her brow pencil to give her brows a more natural shade. If you’re just getting into shaping your brows, these tutorials will get you started on the right foot. They’re easy to follow, and whether you want a straighter look or brows that are more curved and angled, there is something in here for you! 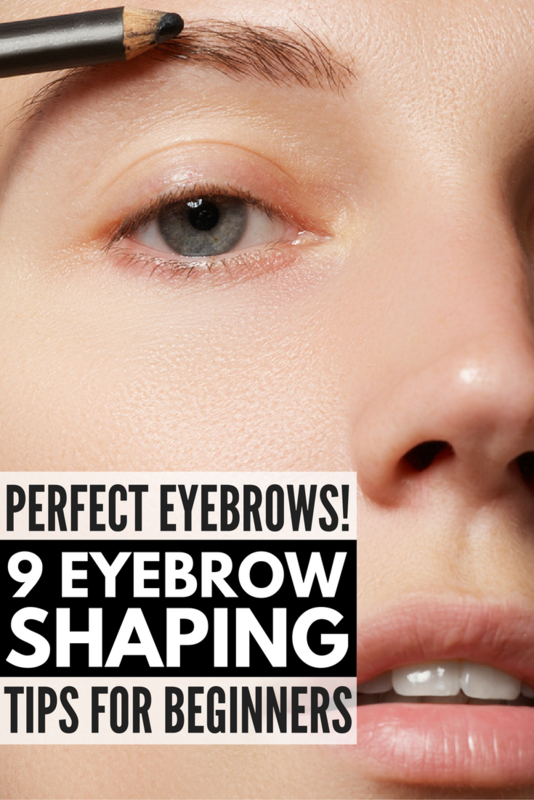 If you liked these brow shaping tutorials for perfect eyebrows, please share it on Pinterest! And if you’re looking for more grooming tips and tricks, please follow our Beauty board on Pinterest!